My friend, Mayron, and I hit the road today. 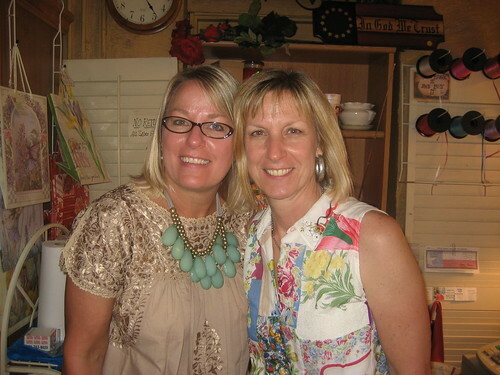 Destination: The Rose Patch in Tyler to see Mo and her sister, the famous Janet, of SweetTalk. Do you know Janet? Such a creative lady. Now would be a good time to wipe the drool off your keyboard, cuz I know you are lusting after Janet's aqua, glass prism necklace! I thought about ripping it off of her neck and running, but she looks pretty fit. And I'm not medically cleared for running. Bummer! 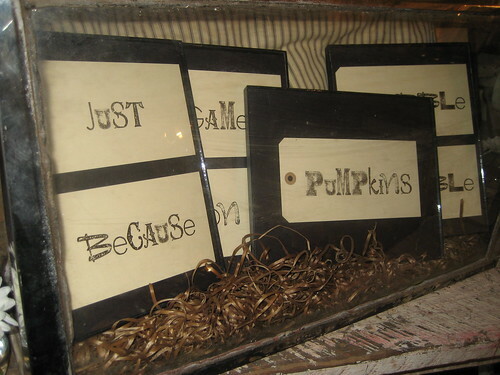 Here's a little sample of Janet's creative cards framed. Hogwash is cracking me up. I like tipping my hat to creative folks. Janet is savvy, isn't she? 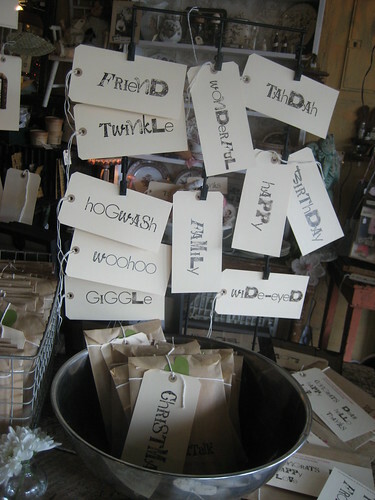 To quote her, she has a "line of antiqued-lettered, individual word, gift and postcard tags. Adventurous, sweet, celebratory, romantic...any word is game!" Janet will be at The Rose Patch, Thursday (8/20) from 11am - 5pm. 117 W. Front Street, Tyler, Texas. Swing by and say hi. They have refreshments and snacks and lots of great visiting is to be had. Did I mention The Rose Patch has some great antiques? Oh, yeah. Sure nuff! Be sure to check out the sink in the powder room. Love it! Any time Mayron and I are together, we end up shopping all along the way to our destination. 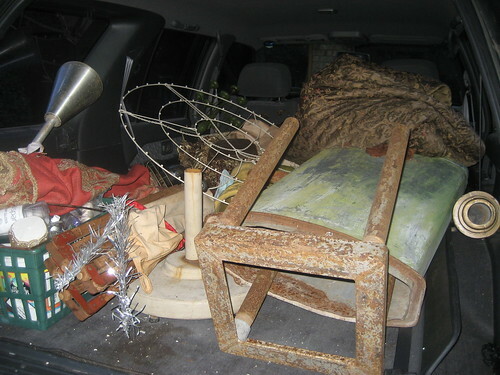 I left with a semi-empty Pathfinder. Wanna see a pic when I got home? This will answer the question as to whether I am preparing for Warrenton. You bet I am! 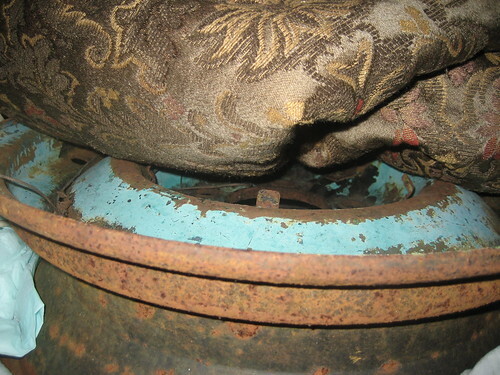 I love the turquoise on this old wheel. Yup. 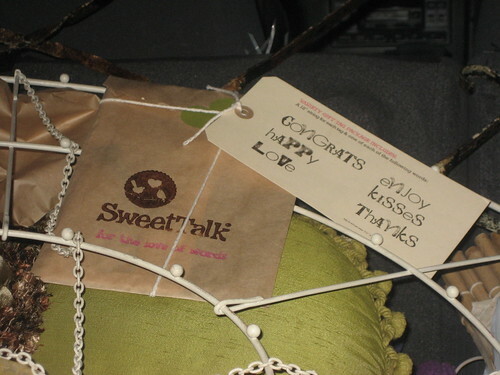 As I offloaded the goods, I was reminded that I did come home with some SweetTalk merchandise. These are going to be great gift cards for occasions to come! Hmmm...your car looks like mine, but sadly, I have no excuse like preparing for a show...it just travels around with me. ha ha. When I say I love this family, I mean I LOVE this family...the whole lot of 'em! I had the privilege of getting to set up by Janet and Mo at Canton several years ago. Those two would keep me in stitches...it never seemed like work being back to back with them. Sport is just as funny and if you get the chance to meet Peg, oh mylanta...you'll understand where all that creativity and zest for life comes from. Just look for the orange nail polish and that'll be her! I didn't get to go and I really wanted to. I was at W&T's twice today...and forgot to take photos both times! Debbie, I should have mentioned, Peg is making an appearance at the store, as well. She is a sweetheart. Maybe you can go visit Thursday. All the ladies are there and the party is on! Mindy, Great stuff!!! Can't wait to see what you bring to Warrenton! Mindy--Thanks so much for the precious post! And to you and Mayron for coming to the SweetTalk party yesterday! It really made my day! See you in a few (short!) weeks! WOW! What a great event in Tyler! I wish I felt better, I'd sneak over there tomorrow. Janet's new line looks amazing, right up my alley. I will have to get a peek asap. Hey, mindy, the other photos just look like junk. You can drop that off at my booth at W&T's and I will clean it up for 'ya. P. S. Still waitin' for the posies... hmmmm? What wonderful pictures and fun. And yes, I was coveting that necklace!